Recently I rewatched Back to the Future, the 1985 pop classic with Michael J. Fox traveling back in time to 1955 to be an impeccably handsome fish out of water who gets his parents (back) together. I was eleven years old when it came out, although I probably didn’t see it until it came to cable sometime in 1986. I have seen it any number of times since then, but I hadn’t seen it in at least the last ten years. I certainly hadn’t seen it since becoming a parent. I am now nearer in age to 1985 George McFly than I am to teenage Marty McFly, and the 2015 in which I live is as far from the present of Back to the Future as 1955 was from the film’s original viewers. Much has changed since I last saw this movie. Yet the movie holds up well. Remarkably well, in fact. I was surprised at just how emotionally invested I was in it, even though I remembered what happened. I can’t say the same thing for the sequels, though. Not only can I barely remember what happened in those, other than that the second one has an evil corporation called BiffCo and the third one has a flying, time-traveling train in it. I started re-watching Back to the Future Part II shortly after Back to the Future and didn’t finish. It was, in the present vernacular, a hot mess. That movie has resurfaced in the popular memory due to the fact that tomorrow, October 21, 2015, is the day on which Marty McFly lands in his journey to the future. In 1989, Robert Zemeckis and company apparently expected 2015 to be the 1980’s with gadgets out of sci-fi serials from the 1950’s—flying cars, hoverboards, and the like. It feels more like an exhibit from a 1980’s World’s Fair than it does an actual movie, despite the fact that the Cubs actually do have a shot at winning the World Series. As for Back to the Future Part III, it’s a bit less of a mess than Part II, and it takes place in 1885, so it doesn’t provide as much fuel for the Nostalgia-Industrial Complex. It plays like a TV movie with very high production values, though. If it had come first, there wouldn’t have been any sequels. What is the difference? Why does Back to the Future endure in a way that the sequels don’t? It’s not because there is an iron law that sequels are always worse than the originals, as there are ample sequels which are at least as compelling, if not more so, than the originals that spawned them (The Godfather, Part II; the entire television run of Buffy the Vampire Slayer). There is something that Back to the Future has that it sequels doesn’t. What makes it so good isn’t the souped-up DeLorean or the gags on the paradoxes of time travel. The sequels had those—too much of those. It isn’t even because the 1950’s are somehow funnier than the 1880’s or the 2010’s. It is what it often is in these circumstances: the original tapped into one of the oldest stories there is, in this case the story of dealing with the conflicted legacies left us by our parents. To see it, you have to strip away all of the extraneous dross to get to the emotional core of the story. Start with peeling away the time travel stuff, which is so shallow as to be nothing more than a plot device. Back to the Future is not a meditation on the paradoxes and promises of time travel. Doc Brown offers a sort of lecture on the so-called Butterfly Effect, but at the end of the movie he flagrantly disregards his own lecture, reading the warning letter 1955 Marty writes to him, and it saves his life. There is also scarcely any attempt to make the movie’s science plausible. The flux capacitor is a complete black box—seriously, it is so sketchy that I think its entire purpose is for us not to ask questions about it—and Doc Brown, its inventor, is portrayed more as a loopy but persistent crackpot than a scientific genius. He thought of the thing after whacking his head on the sink, for goodness’ sake. He probably doesn’t even know how it works. Back to the Future II does more to mine the pitfalls of time travel than the original, and presents us the spectacle of a Doc Brown who actually seems to know what he is doing, all of it to no real benefit. Along with the time travel business, take away the 1950’s-specific stuff, at least for its own sake. There are plenty of movies that examine 1950’s America from a variety of critical standpoints—Peggy Sue Got Married, American Graffiti, Pleasantville, et cetera—but Back to the Future isn’t one of them. There is a brief hat tip in the direction of the era’s racial prejudice, but mostly the 1950’s are a source of fish-out-of-water jokes and set-ups for plot details back in 1985. A young man comes to understand how his unhappy, inept parents came to be the way they are, and that they weren’t always like they are now. He also comes to realize that, despite their unhappiness, his own existence is bound up with their chance meeting and falling in love. He helps overcome the flaws that led them to be the people he knows, and in the process redeems them and himself. Pretty heavy for a popcorn movie, and yet without it I guarantee you no one but 80’s nostalgia enthusiasts would care about it. The movie sets up the dynamic brilliantly at the very beginning: cowardly, milquetoast George McFly, his unsatisfied, alcoholic wife Lorraine, and their underachieving kids. The youngest appears to be Marty himself: good-looking, talented, more or less confident, has a cute but nondescript girlfriend. He could go on to Be Somebody. But he is also beginning to exhibit some of the same fears and hang-ups (in his case, about public performance) that, we soon learn, hamstrung George’s life, too. Marty is ashamed of his parents, and in particular at his father’s spinelessness, yet he is already beginning to hear the ghosts of his parents’ failures in his own words. Marty has an improbable (and completely unexplained) friendship with Doc Brown, the old crackpot inventor who only seems to have come up with one working invention, and that is the time-traveling DeLorean itself. We don’t know exactly how Doc Brown is able to sustain his crackpot lifestyle—independently wealthy, perhaps, especially since we find out later that 1955 Doc lives in what is basically a mansion. But he is unsuccessful as a scientist and inventor, and appears to have been unsuccessful for a very long time. The time machine is his bid for scientific redemption, and yet his mad scheme for obtaining the plutonium fuel it needs is what costs him his life at the hands of Libyan terrorists. Doc Brown is yet another authority figure surrounding Marty who is a lovable, washed-up failure. Then the working time machine, a sleek, 88-miles-per-hour MacGuffin, lands Marty in 1955, where Marty’s real work begins. In 1955 Hill Valley he manages to meet, in short order, both of his parents as teenagers, back when they had hopes and dreams and enough spirit to do naughty things like be peeping toms or drink in parked cars with boys. These are both people who we want to believe could Be Somebody Too. Yet Marty has a problem: The teenaged version of his own mother only has eyes for him, and if she doesn’t start looking in George McFly’s direction soon, he will fade out of existence. The only way to save himself, as it turns out, is to save their meeting, which coincidentally involves saving George McFly from his own cowardice. The dynamics of the plot don’t entirely withstand careful scrutiny. The key scene where George knocks out Biff and sweeps Lorraine off her feet is problematic. It renders Lorraine uninteresting, a pretty little thing free for the taking to anyone willing to use their fists. (As much as it might help one, despite itself, become a feminist, Back to the Future certainly isn’t especially feminist as regards character development.) Even if we just stick to the movie’s own internal logic, the movie doesn’t explain why, this time around, Biff is suddenly so interested in Lorraine that George has to fight with Biff to win her affections. We don’t get the sense that anything like this happened the first time around; if it had, wouldn’t 1985 George have always been the successful, confident, tennis-playing sci-fi author Marty helps him to become? 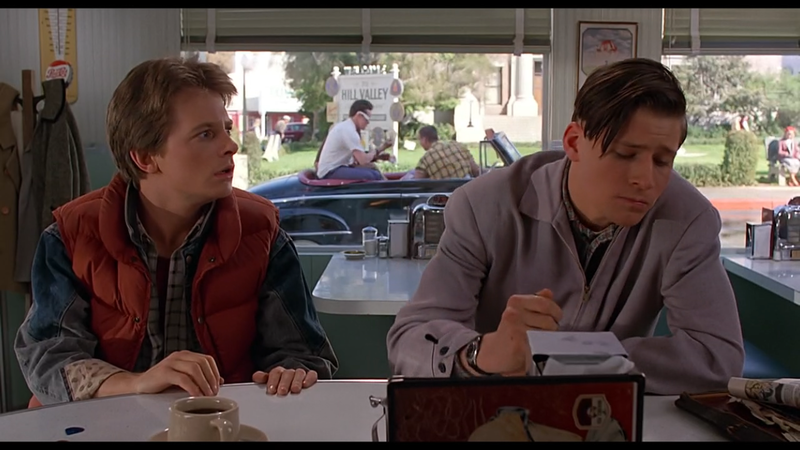 Does Marty being in the picture in 1955 somehow cast Biff’s attention towards Lorraine? These are unanswered questions; yet, the very fact that they are unanswered, unanswerable, impertinent even, just calls further attention to the fact that the story really isn’t about time travel at all. It’s about Marty coming to terms with the reality of who his parents were and are, and his own life in light of those realities. Yet the time-travel aspect of the story of Back to the Future that everyone remembers, and that gives the movie its title, is also probably its greatest weakness. It’s almost as if the movie recoils at the weight of its own theme. After all, not only is Marty’s family depressing and seemingly hopeless, but his mentor, Doc Brown, gets murdered by terrorists. What is he supposed to do about that? Hey, he’s in a time machine! He can go back and fix everything! Which he does, and even better than he dared hope. It’s a grand bit of wish fulfillment. It’s also not particularly psychologically realistic. Compare this element of Back to the Future to the indisputably superior treatment of the same idea in Harry Potter. From early on, Harry is haunted by the legacy of his parents, yet he is cautioned early on by Dumbledore not to waste his life wishing for them back as he stares into the Mirror of Erised. The wizarding world also has time travel (in the form of the Time Turner), but, unlike Doc Brown, the wizards actually stick to their own advice about the dangers of undertaking massive overhauls of the past. (Even Voldemort, apparently, who you would think have had both the power and the will to steal a Time-Turner, go back in time, and kill James and Lily Potter before they even had a son.) Harry deals with the conflicted legacy left to him by his parents and elders (including Dumbledore and Snape) the only way one can—through struggle in the present (and an occasional glimpse at the past in the Pensieve). In fairness, Marty McFly doesn’t set out to fix his parents. He is, at the beginning, just the typical arrogant teenager, the standard-bearer for the power of Van Halen and Pepsi Free to change the world. (Hope I die before I get old!) We end up rooting for him because, in going back in time, he learns that his parents are people worth knowing, and that in the end he can’t fix his own life without them. This entry was posted in Uncategorized on October 20, 2015 by bcubbage. 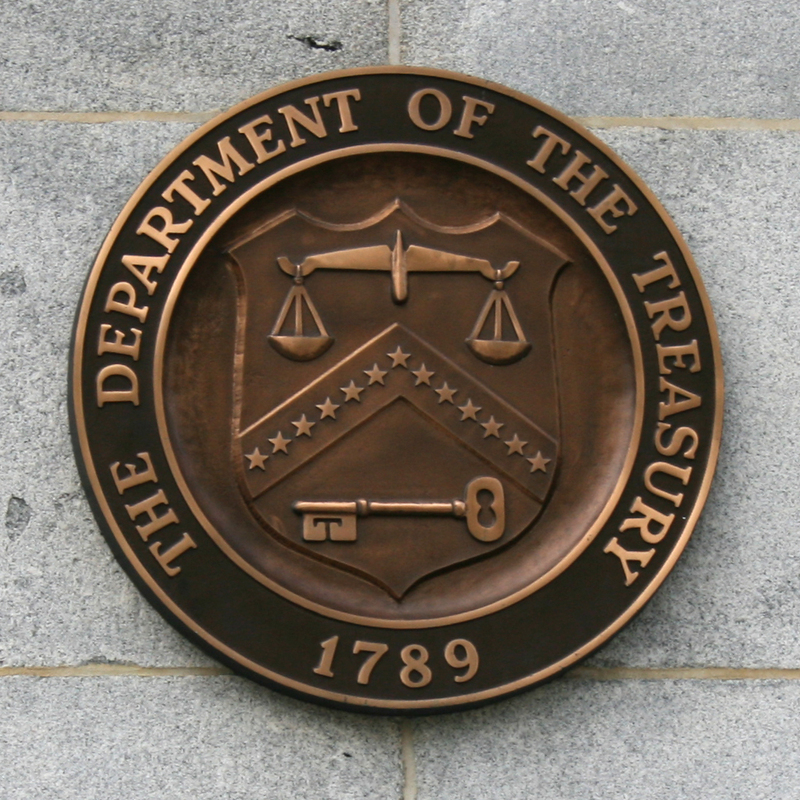 On Monday, August 4, the federal Office of the Comptroller of the Currency (OCC) issued a risk management bulletin to its supervised banks (i.e. national banks) giving them guidance on how they should handle sales of seriously delinquent, “charged off” debt to third-party debt buyers. The OCC’s guidelines mandate a minimum quantity of account documentation the bank must supply the debt buyer upon purchase, and they also forbid the sale of certain categories of accounts, such as accounts belonging to deceased persons and accounts which are included in a pending or concluded bankruptcy (yes, unbelievably there is a market for these debts). They also require banks to do some due diligence on a debt buyer before selling debt to it. This guidance formalizes advice the OCC issued back in July 2013. It also broadens the scope of concerns addressed last year in a consent order between Chase Bank and the OCC regarding its sales of consumer debt. I am glad to see it, but it goes to show how long it can take regulators to catch up to the facts on the ground. The large abuses these guidelines are meant to combat reached their height in 2009 or 2010 in my opinion. This entry was posted in Uncategorized on August 6, 2014 by bcubbage. I read an interview with David Graeber this morning that captures one of the reasons I never felt like I fit in in the academy. I always thought that the point of being an academic was to have fun. Books are fun, words are fun, ideas are fun; the fun of those things were about all that got me through high school and college. Along the way, in the midst of all the fun, we might all learn something, of course. I always thought, though, that we should at least be having fun, and showing our students how to have fun, too. The reason to go into academia is because it’s pleasurable, it’s fun, it’s basically a form of play—you get to play with ideas. But somehow academics manage to convince themselves that—what with the insecurities of the job market—in order to get that security, that comfort, you have to give up the pleasure. You have to become this boring, pedantic academic politician, saying the right things, thinking the right things, publishing in the right places. It all becomes this careerist, professionalized cage, and you hate yourself for it, and thus what you really hate is anybody who seems to be having fun. Over the course of my academic life, a steady drip of seriousness wore down any sense of fun there might have been in the whole enterprise. I was a “Continental” philosopher, one of the ones most committed to the notion of fun, at least in theory. (Don’t get me started on analytic philosophy, which is basically just English common law without state-sanctioned judges.) Even there, though, fun was difficult for me to maintain. He was right, of course. It was not very professional. It was not world-historically insightful. I was still disappointed, though, because before all else it was fun. It was exciting. It made me excited to research it and write about it. My director’s message, though, was clear: Your fun is not professional. Of course, we academics get sent this message over and over again. Fun, we are told, is something that has to wait until after you get tenure. (Except, of course, that hardly anyone gets tenure anymore, and the process makes it so that most who get it need years of therapy to learn how to have fun again.) Fun doesn’t get you published in the “right” journals, doesn’t get you promoted. Fun doesn’t solve all of the depressing problems of the humanities and higher education. Fun is for your private life, assuming you retain the capacity to maintain one that goes beyond drinking and canoodling with students. (I never had the slightest inclination or desire to canoodle with students, by the way.) Fun is no way to become a respected functionary in the university and disciplinary bureaucracy. Yet I kept insisting on making the work fun. I am not sure I know how to do anything else. I had to struggle to get a dissertation completed and defended–long, complicated story there, and I won’t tell it today. The finished product was an awkward, goofy failure. I look back on it and I giggle a bit that a research university approved it, actually. My committee was complimentary, but their primary substantive remark was that what I was doing was “exciting” and “original.” I now think that they were in effect saying “Here is someone who insists on making this academic research thing fun.” It was possibly the kindest thing they could say. My dissertation stank. It was, though, the clear work of someone who was having fun. I have a lot of complicated regrets and griefs left over from my old academic career. One thing I can say, though, with some pride is that, as bad an academic as I ended up being, I managed, at the core of it, to enjoy myself. At least I had fun. This entry was posted in Uncategorized on February 22, 2014 by bcubbage. Today an article in the L.A. Times about a change to Capital One’s credit card terms and conditions has been making the rounds of social media. Per the article, Capital One has inserted language giving itself permission to visit cardholders at their homes or places of employment with regard to their accounts and to modify or suppress the way in which its calls display on cardholders’ caller ID systems. The article left unsaid (but clearly implied) that most likely Capital One would do one or the other of these things in the context of attempting to collect on delinquent accounts. While a spokesperson for Capital One sought to reassure cardholders and the general public that they had no intention of sending representatives out to find them and no intention of spoofing caller ID systems, the language itself sounds alarming. The contract language raises a good question: Just what can a bank like Capital One do to collect a debt? The L.A. Times article dispatches one issue very quickly: the provision allowing Capital One to visit you at your home or place of employment almost certainly does not violate the 4th Amendment to the U.S. Constitution. That amendment has to do with unreasonable search and seizure at the hands of law enforcement. Capital One is not law enforcement, so this language doesn’t raise a 4th Amendment claim. Just as A&E can fire Phil Robertson from Duck Dynasty for what he says without it raising a 1st Amendment claim, Capital One can ring your doorbell to collect a debt without raising a 4th Amendment claim. Depending, however, on the way Capital One went about visiting you personally, or the frequency with which they did so, their actions could potentially violate other state or federal laws regarding invasion of privacy, harassment, or debt collection. If Capital One did decide to use more confrontational (and potentially deceptive) collection tactics, though, they could at a minimum face greater regulatory scrutiny. In recent years, bank regulators (including the Office of the Comptroller of the Currency, or OCC, the regulator with oversight over Capital One and other national banks) have taken a greater interest in what they call “reputational problems” with banks—a general phrase for anything that erodes consumer and public trust in the fairness and stability of the banking system. Back in September 2013 I wrote about (http://briancubbage.com/2013/09/20/chases-collection-debt-sales-reined-in-by-regulators/) a consent order entered into by the OCC and Chase Bank that made waves in the world of consumer credit and debt collection. Citing, among others, reputational problems arising from Chase’s practices of suing consumers over delinquent credit card debt and sales of delinquent debt to third-party debt buyers, the OCC got Chase to agree to do greater due diligence to ensure that their accounts would end up in collection litigation or in the hands of others who would use dubious collection tactics. Sending out hired goons to a cardholder’s house, if it made the papers (which is likely enough), would be just the sort of reputational problem that would get regulators’ attention—and Capital One certainly knows it. Of course, the simplest way around all of the negative press would have been to avoid putting clauses like these into their credit card contracts to begin with. I am mystified by why Capital One would include such contractual provisions if it had no intention of invoking them. Generally, all of the fine print in the terms and conditions of a credit card account is there for some reason, including those lengthy arbitration agreements. Credit card companies certainly use those, most notably as a tool to defeat class action litigation, even though binding arbitration has a history of scandals and is currently under scrutiny by the Consumer Financial Protection Bureau (CFPB). Capital One must think there is some benefit to them from having these new clauses in their credit card terms. I am just hard pressed to know what the benefit could be. All of this raises the question: Would visiting cardholders in person and taking measures to defeat caller ID systems be illegal under consumer protection and debt collection laws? The answer is probably, it depends on where you live. There is a federal law—the Fair Debt Collection Practices Act, or FDCPA, 15 U.S.C. §1692 et seq.—that limits debt collection activity. All of the potential collection activity under discussion here would, if done by, for instance, a collection agency, probably violate the FDCPA. However, the FDCPA does not cover the collection activity of original creditors who are attempting to collect their own debts; they are specifically exempted under 15 U.S.C. §1692a(6)(A). The only exception to this rule is if an original creditor is collecting debts using another name than their usual name “which would indicate that a third person is collecting or attempting to collect” a debt (§1692a(6)). So, if Capital One did directly employ collection agents who went to your house to collect, their (mis)conduct would not be actionable under the FDCPA. For the same reasons, it wouldn’t be an FDCPA violation for Capital One to modify or suppress the caller ID information of its in-house collection staff. There is a separate law, the Truth in Caller ID Act of 2009 (TCIA), that prohibits “any person” (including corporations) from “caus[ing] any caller identification service to knowingly transmit misleading or inaccurate caller identification information with the intent to defraud, cause harm, or wrongfully obtain anything of value.” The question, though, is whether a bank who transmits misleading caller ID information while attempting to collect a cardholder’s debt is “intending to defraud, cause harm, or wrongfully obtain anything of value.” If they could show that they had a legitimate interest in reaching the consumer to collect a debt and that their caller ID spoofing did not cause harm, they could probably avoid claims under that act. For instance, the U.S. Court of Appeals for the Fifth Circuit found in 2012 (in Teltech Systems, Incorporated et al. v. Phil Bryant et al., 702 F.3d 232) that Mississippi’s Caller ID Anti-Spoofing Act was preempted by the federal TCIA because the Mississippi law did not allow for what the opinion called “non-harmful spoofing.” While the non-harmful spoofing envisioned by Congress when enacting the TCIA was in the first instance that potentially undertaken by law enforcement or intelligence agencies of the federal government, private businesses have certainly taken note of the decision. The answer to whether Capital One could legally use the collection tactics envisioned by its contracts would depend on state collection law. While many states (including Kentucky) have no separate debt-collection law to speak of beyond the FDCPA, many do. Some mirror the FDCPA, while others go significantly beyond it. Interestingly, the L.A. Times, a major California newspaper, fails to mention the fact that California’s Rosenthal Act codifies some of the strongest consumer protections against debt collection abuses in the country– and its strictures extend to anyone who is collecting a debt, even original creditors like banks. California Attorney General Kamala Harris made headlines last May, for instance, by bringing a major case against JPMorgan Chase for alleged Rosenthal Act violations relating to Chase’s collection litigation against California consumers. This entry was posted in Uncategorized on February 18, 2014 by bcubbage. The following is a sermon delivered on Sunday, February 16, 2014 at Douglass Boulevard Christian Church (Disciples of Christ) in Louisville, KY. Thanks to Derek Penwell, our senior minister, for extending the invitation to me to preach, and to everyone in attendance for your attention and your kind remarks. I think it is safe to say that most of you here today come to this church because God is stirring your heart towards a view of following Jesus that centers on grace, love, and acceptance rather than condemnation and judgment. Certainly that is why I am here. I keep on coming back because of the Jesus who says that loving God with all your heart, and your neighbor as yourself, are the whole of the Law and the Prophets. So today’s Gospel lesson, from the Sermon on the Mount, may sound jarring to us. It does to me. This is not sweetness-and-light Jesus. This is law-and-order Jesus. This is “tough on crime” Jesus. Here we have the Jesus who warns us against the fires of hell, the Jesus who tells us to cut out our eyes and cut off our hands and throw them away if they cause us to sin, the one who rails against divorce and adultery. This passage evokes for me the Southern Baptist revival preachers of my childhood, who gloried in warning us against the panoply of things that would land us in the lake of fire for eternity, and– I will be honest– it makes me squirm in my seat, just like I always did at revival time. This is the Jesus I pretend not to know at the party when he starts to get on his high horse. I struggle with this Jesus. I suspect many of you do too. I find, though, that when Jesus, or anyone else, makes me struggle like this, I have something to learn from them that I need to acknowledge. It may not be apparent at first what that something is; it may not be what either of us thinks it is. But the lesson is there, and in the struggle over it we both find ourselves on the way to someplace we need to go, if we will just trust in it and not break away from it. Now, in Protestant Christianity there are many who would like to interrupt my sermon at this point to make hay about the notion of “taking scripture literally.” Perhaps it is a coincidence, or perhaps it isn’t, that many of those who make the most of “taking scripture literally” deploy the notion in the service of bolstering what they deem to be the “tough on crime” messages: that God prepares a place of everlasting torment for some of us, and that sending some of his beloved creatures there is to the greater glory; that we are all sinners but “those people” (wink wink, you know who they are) are worse sinners than others; that we just can’t let women preach; that we have to keep those awful queer folk out of church. “The Bible” says so, after all. So they say, anyway. It would seem like this passage from Jesus’s Sermon on the Mount would be theological red meat for this view of Jesus and scripture. On its face the message we hear today is tough– very tough. We hear in no uncertain terms that all sorts of things are forbidden to us, and that doing them merits us a one-way ticket to the lake of fire– although, in fairness, what the New Revised Standard Version of the Bible which I read earlier translates as “hell” is really “Gehenna,” a valley on the edge of the Old City of Jerusalem, not some ethereal afterlife domicile of the damned. Still, it would be very tempting to leave the matter there, with all the adulterers and divorcees writhing on Jerusalem’s everlasting tire fire, except that the totality of what Jesus is recommending, taken with sheer literality, is so outlandish that pretty much no one, not even the most devoted “Biblical literalist,” has ever really done what he is suggesting. I do not know of any “Bible-believing” church in which people gouge out their own eyes or cut off their own hands in the service of Biblical fidelity. (Perhaps such a church has existed in the long history of the faith, but I cannot imagine that it held many adherents for very long.) Even devotees of “taking the Bible literally” have to concede that Jesus is after something deeper than what lies on the literal surface of his words. Our only other option would be to turn the church into a butcher shop, and that seems…, well, counterintuitive, to put it mildly. So. What is Jesus after? I think that Jesus is pointing us here towards an idea about “the Law” that Paul, the first theologian of the church, developed at greater length in his letters. The idea, briefly put, is this: The Law, in virtue of its function of setting boundaries around what is permitted and what is not, brings about the very conditions of its own transgression. Here’s what I mean: Before a law exists making some conduct unlawful, there is no such thing as breaking the law with respect to it. There is quite simply no law there to break. When the law exists, though, only then is there such a thing as breaking it. To paraphrase the philosopher Hegel: Creating a lawful boundary involves at the same time creating a space on the other side of it, and even (or especially) when we recognize that boundary as a boundary and self-consciously dwell within it, we simultaneously occupy that space on the other side virtually in thought. While we tell ourselves that we are staying within the boundaries set for us, we are really declaring mastery over those boundaries by assigning those boundaries to ourselves, and hence stepping over them. All that is highfalutin language for a thing we all experienced as kids. Surely this happened to you: Mom or Dad or some other authority figure says, “Stay out of that room!” or “Don’t open that drawer!” and then what happens? Yep– suddenly that room or that drawer becomes the most interesting thing in the universe. The mind fills up with visions of what must be behind that parental prohibition that is so important: something obviously great, or terrible, or both. Then, there is but one option: We have to know what is in there, or else let our wild imagination fill the blank. We have to test the boundary. We have to see how firm the boundary is, to know whether there is some way to purchase minimal compliance with it while still getting what we now so desperately want. This phenomenon is not, of course, just a peculiarity of Christian theology or of naive childhood. If you have ever had any contact with what the corporate world calls “compliance departments,” you know exactly what I mean. If corporations are people (corporations are people, my friend, or so I heard), then their attitude towards law and regulation is every bit as calculating and scheming as that of the toddler who desperately longs to gorge himself in the cookie jar. “What is the bare minimum we have to do to comply with the Clean Air Act? The Affordable Care Act? with bank regulations?” Coming up with creative ways to secure technical compliance with, but substantive transgression of, laws and regulations is, to some people, not only a way to gain a competitive advantage, but their solemn duty as good Americans. What is Jesus trying to say to this law-and-boundary-obsessed state of mind? I think he is trying to remind us that, in the case of God, the purpose of the Law for us is not to invite us into a struggle in which we seek to master the law. It is not to give us a convenient checklist of things to do so that we can feel like we are just good enough as we are and go on to Sunday lunch with a clear conscience. It is instead an invitation to come face to face with who I am, with who we are, and to allow God to transform us together. The vision of the Law Jesus provides us in the Sermon on the Mount is, if anything, so impossibly strict as to be beyond the reach of anybody’s ability to comply. The roots of the non-compliance lie inscrutably deep in the human heart, at the very wellsprings of our willpower. I mean, really: Who hasn’t at some point looked at another with desire, however fleetingly? Who hasn’t come before God harboring some resentment against another? Before the Law as Jesus understands it, there is absolutely no hope that you will ever come before it and justify yourself. Who could come clean before its judgment seat with both eyes, both hands, intact? What good is it to be perfect if at the end all you are is a perfect pile of severed limbs? What are you supposed to do, then? Just this: stop trying. You heard me: Stop trying. Stop trying to be perfect. Stop pretending like you have the willpower to justify yourself and your existence, to outdo everyone else who ever lived, including God. After all, what did Jesus say in last week’s lesson? How soon we forget. You are salt and light. You, right there, just as you are: Not as you might be if you would just stop playing poker in the fellowship hall, or say fewer swear words, or lose weight, or pay off your credit cards, or earn more money. No. As you are, full stop. This doesn’t mean that we are supposed to forget about God and the Law, or that we shouldn’t try to do better. It is, rather, to allow our struggle with those things, our awareness that we have fallen short of them, to remind us who we are, and to help us grow with God’s help into more than we could ever imagine. That is why the Law exists, and that is why Jesus came to fulfill it. Jesus, and the Law, are trying to point you towards something much more important than unwavering compliance with some standard of perfection. The Sermon on the Mount is Jesus pointing, arm outstretched, towards something greater than the impossible standard of perfect compliance. He points towards that something greater, and yet so often all we manage to do is stare uncomprehending at the tip of his finger, like the family dog. At what does Jesus point, then? It seems to me that he is pointing us away from ourselves and whatever struggles we are having with God and the Law and towards a right relationship with one another. Before the things we do to earn individual favor with God have any value, we are called to right relationship with our brothers and sisters. If you are before the altar and someone has something against you, nothing you do before God at that altar is going to fix that. Your tithes and offerings, however lavish, will not buy you loving relationships with others. Your brick walls cannot hide the injustice of your relationships with those around you. Your gilded crosses and your steeples will not keep out your inhumanity– my inhumanity, the callousness of our indifference, the depth of our exploitation of other people and of the natural world. Greater and more wondrous a creation than any law, even the whole of the law itself, is the human being sitting in the pew next to you right now. Greater than any law is the person freezing in the street. Greater than any law is the queer or trans* youth thrown out of their house without a place to stay, the migrant shunted from country to country and scapegoated for all of society’s ills. Who among you can honestly say that you have been reconciled to all of those, not just to a few tokens who you keep around so you can feel “tolerant” and “broad-minded”? I sure can’t. Reconcile yourself to all of those, Jesus seems to be saying, and maybe then we can talk to the celestial compliance department about how much is just enough of a gift to leave on the altar for you to feel good about yourself. We are fearfully and wonderfully made, and God has given us power– more power, indeed, than we usually acknowledge, perhaps more than we really want. We lack the power to outfox God and make ourselves perfect. Our power is different. Part of that power is the power to say “yes” and “no” to others. Our identity, our bonds, the world in which we live is brought about by those things and those people to which we say “yes” and “no.” Our “yes” and “no” require no other oath, Jesus tells us; to think so is to listen to the “evil one.” They stand without support from the sky above or the earth below or the throne of the sovereign. Whether we take the step to be reconciled with our brothers and sisters starts with our ability to say “yes” to that reconciliation, as terrifying and as threatening as it may appear. It doesn’t end there, but it has to start there. And we have to own what those yeses and no’s mean: They mean nothing less than our creating, or not creating, the world God intends for us, one in which we are going to live in a world with our fellow beings, all our fellow beings, or attempt to slip away behind walls of privileged avoidance in which we pick and choose who we shall recognize. It seems to me sometimes that I am surrounded by Vaders. The Vaders are the ones who do not wear their hearts on their sleeves, who protect themselves from exposure. They do not display themselves in all their weakness to disarm would-be detractors, adopt a deceptively submissive pose to fool fearsome opponents. They do not broadcast their flaws, do not reach out to others by seeking and embracing a communion of weakness, of understandable frailty. (Many is the friend I have made this way, when we saw, in the turn of an instant, talking, that we knew each other best not through our successes but through our failures and our wry awareness of them.) Vaders do not make inappropriate remarks at dinner parties, let down their guard in drunken moments to reveal the wanting soul within. The Vaders are too smart for that, and they know which side their bread is buttered on. The Vaders know about masks. They use them well. And of course, the strongest of the Vaders rule the world. Today we have the power to decide who it is we shall be. Are we going to be Vaders, hiding behind masks of impassivity, saying “no” to others, speaking only of our imagined successes through our metallic throatboxes, ruling the world in the service of Empire, but then– dying like Vader: as Millet writes, “ravaged and half eaten-up by machine,” “bound up in the tragedy of our own silence”? Or are we going to say yes? Yes to God, yes to the other people with whom we share this city, this country, this planet? The opportunity to start saying that “yes” is literally as close to you as the people in this room. This entry was posted in Uncategorized on February 16, 2014 by bcubbage. I am a day late with my photo for Day Sixteen of Advent, but no matter. Better late than never. 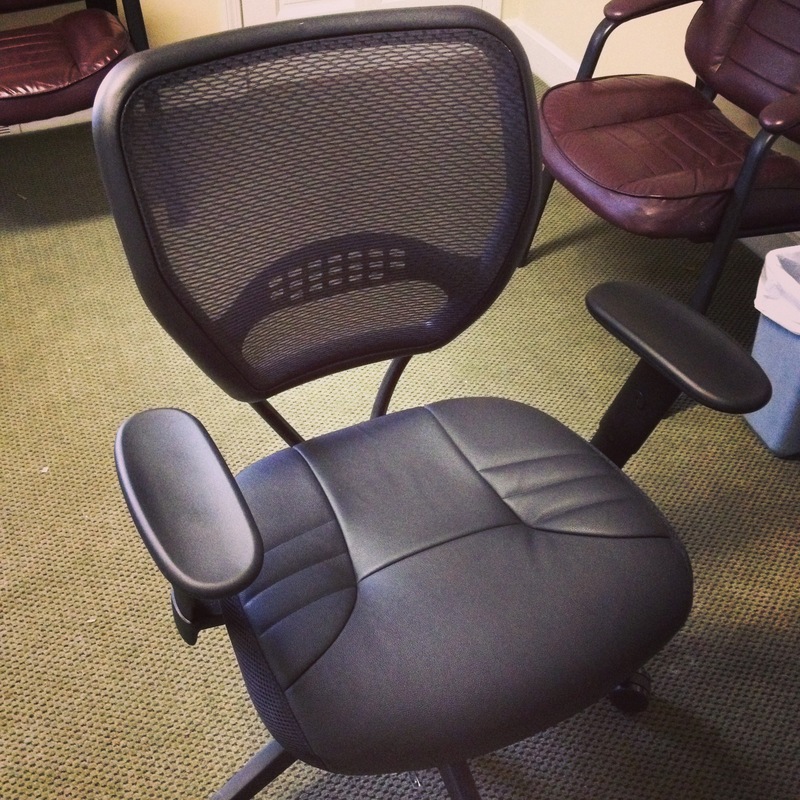 This photo is of a co-worker’s office chair. He had a procedure done last week. He is recovering quite well. He is a driven and productive person, though, so naturally he wants his recovery to be complete yesterday. He came to work today, but after a few hours he was in considerable pain and so had to go home. He was disappointed. This is not how he wanted the day to turn out for him. He is in a position he finds uncomfortable: weakened and needing help. I know myself well enough to know that I would feel the same way. I feel worthless when I am not producing something. I hate asking for help. Sometimes, though, toughing it through does no one any good. Sometimes the strong thing is simply to go home, to regroup, to be deliberate about what needs to be done and what doesn’t, to balance care for others and care for one’s work against care for oneself. Sometimes the strong thing is to ask for help when you need it, and to be willing to accept help. Sometimes the strong thing is not being productive. I am a cisgender man in the United States. The way I experience what that means is that I have been socialized to be self-sufficient above all and to view vulnerability as a weakness and a liability. It has taken me until my middle age to learn that vulnerability is a source of strength. It points towards the values that motivate me, the people and the things I care about, the compassion that connects me in solidarity with others. Vulnerability is terrifying and it hurts sometimes– a lot, actually– but, when coupled with a strong sense of appropriate boundaries, it allows me to flourish. The Jesus I encounter is not the muscle-bound MMA fighter of a certain megachurch pastor’s fantasies. He is one who says to me, as he said to Paul, “power is made perfect in weakness” (2 Corinthians 12:9). He is the one who triumphs over death, but still retains his scars. This entry was posted in Uncategorized on December 17, 2013 by bcubbage. The above photo is my submission for day thirteen of rethinkchurch.org‘s Advent Photo-a-Day project. 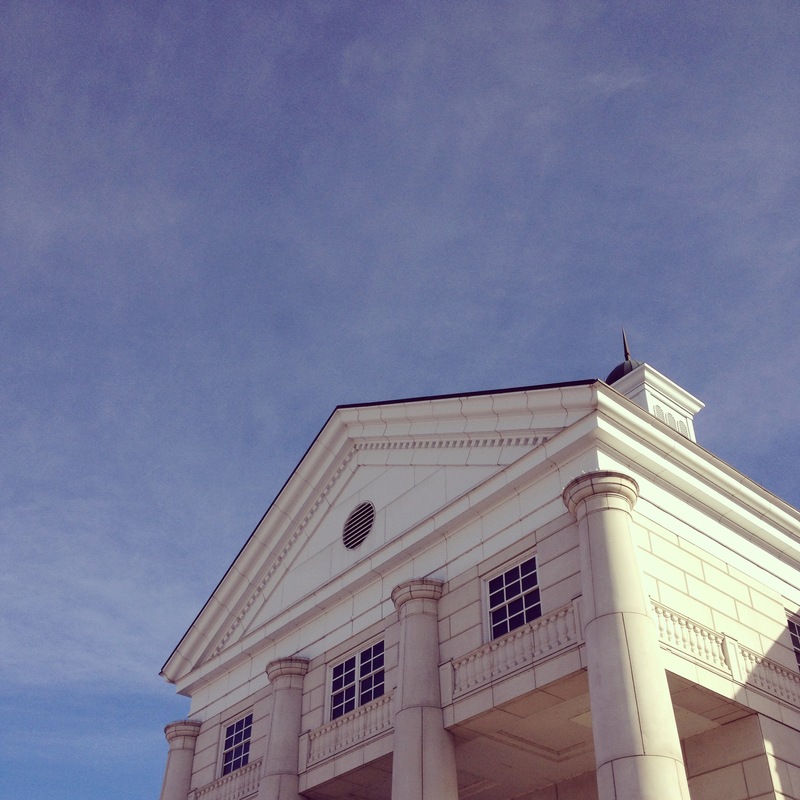 I work in legal services, so I see a lot of places like the courthouse in my picture for today. Many courthouses are like this one: massive, tall, made of marble and brick, with Neoclassical design features on the outside. They are meant to convey something about the nature of justice in our society: Established, impassive, authoritative, large, impersonal. They give the impression that justice– the justice of the state and its institutions– brings to bear the very weight and stability of the earth itself. Like many people, I have found the notion of institutional justice– justice tied to authoritative institutions, to procedures and policies– very seductive. It is tempting to think of these things as being the whole of justice, or else that part of it that we can talk about profitably. I have been too close, though, to the heavy machinery of juridical institutions to believe that they have much to teach about what justice really is. The courthouses and judicial fora have their place, no denying that, but justice is not bound up in them. What’s more, their own custodians and functionaries are well aware, in their more honest moments, that these institutions do an imperfect job at bringing about even the small piece of justice that is their special remit. Justice, if such a thing is to be found in this world, can only be found in the lives of liberated beings. Justice, if it exists, exists not in process and procedures, in insignia and architecture, but solely in flesh and blood, skin and bone. Justice is not the sort of thing that, like a marble courthouse, could keep standing until the end of time even if humans ceased to exist. Justice resides in life, in the flourishing of individuals, and in their shared striving for liberation. We who are Christians do well to remind ourselves of these things, especially this Advent season. We do not await one who came in judge’s robes, brandishing the sigils of authority. We do not await one who came with thousands of followers, with large church buildings, with publishing and broadcasting empires, with relevance and cultural capital. We instead await one who came as a baby, illegitimate and fragile, defenseless and unable to speak. We await one who, almost from the time he is born, has to flee those who would have him put to death, and who ultimately met his death at the officious hands of Empire’s functionaries. We say that God is such as that. We also say– or should say, if we are faithful– that God’s justice is for such as that. This entry was posted in Uncategorized on December 13, 2013 by bcubbage.